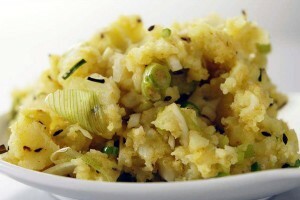 Aloo Ka Bhurta recipe by Batul at DesiRecipes.com. Boil the potatoes, peel and mash. Fry the onion , add the mashed potatoes and the other listed ingredients. Good and easy to cook! I think the recipe called for 2 or 3 chilies not 23! Was a mistake. Now corrected. Thanks for brining into our notice. do you want to kill me with 23 chillies?